Paula Sergi of the Foot of the Lake Poetry Collective in Fond du Lac won first place and $500.00 for her proposal to collaborate with cultural centers in her community to bring poetry to the local farmers' market, library, art center and harvest season festivals. Poems about food were on display at vendor booths and sandwich boards at the farmers' markets; bookmarks featuring the poems and corresponding recipes were at the Fond du Lac Public Library and the Women, Infants & Children (WIC) office; poems were paired with art and on exhibit at the Windhover Center for the Arts, with readings by contributors at the Fondue Festival, and at Park Ridge Organics Farm. 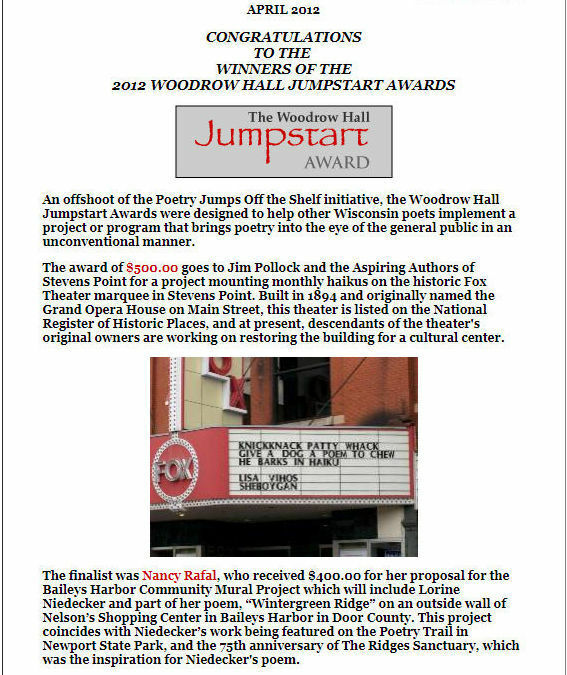 Phil Hansotia of Ellison Bay and the Wallace, Unabridged and Word Women poetry groups of Door County took the finalist position for $250.00. Display cases of poetry were mounted along two trails in Newport State Park with receptions at the Newport State Park shelter and visitor center prefacing each season's presentation of poems. Throughout 2010 and into 2011, the work of former Poet Laureate, Ellen Kort, and local poets were featured, as well as the contest winners of three area high schools. Jan Chronister of Maple received the first place award for her program titled, "Ojibgewin" which involved teaching a series of poetry classes on the Bad River Reservation in Odanah.